There’s still some other things that need to be done. Our ballot is MASSIVE and I am mostly done with it (I’ve got a couple of mill levies and some of the smaller position elections still to be, but have done the 12 amendments and propositions–what the heck–plus important elections like congresspeople and governor) but that needs to be finished up, and we’re planning a super-secret vacation to Disney World. Which, Lord, takes more planning than expected. We’ve got airfare and hotel done, but you’ve got to do reservations at the restaurants or you’re out of luck. And apparently for character appearances, though we’re too early for that. My husband super wants to eat at Cinderella’s Castle, but so apparently does everyone else, so he’s hoarding reservations at bad times and is checking daily to see if better ones open up. But I should have writing time back! Hooray! And, I mean, a ton more, but those are top of the list. I’m considering taking on a non-programming class. Skillshare has a ton of classes (you pay a flat fee per month) and I’d like to learn how to color/shade, which I am terrible at (which is why you get line art here on the blog). I’m still learning, but hopefully it won’t be as intense as the programming class, and it’ll be useful if/when I do get to the illustrated chapter books ideas. What are your plans for November, squiders? 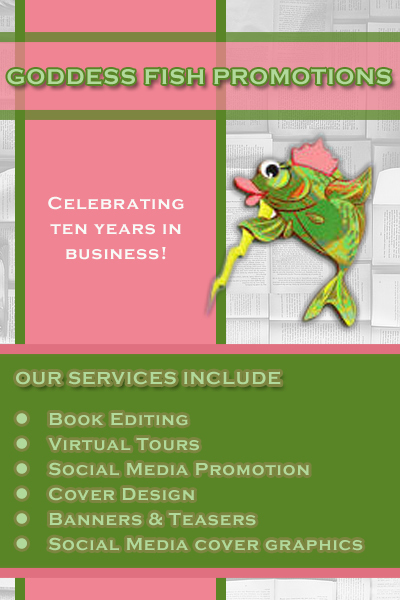 Happy Tenth to GoddessFish Promotions! GoddessFish is celebrating their tenth anniversary this month with a blog tour. Siri and I used them for our City of Hope and Ruin blog tours when that book came out and were generally pleased with the experience, so if you’d like to do a book blast or a blog tour (including reviews), take a look at GoddessFish. I have survived the con again! Yay, go me. It was actually pretty relaxing, all told, except for panel nerves, a lot of which probably stemmed from the fact that I was the youngest person on all my panels, usually by a matter of decades. That’s kind of MileHiCon in a nutshell, though. It gets a lot of major speculative authors, but a lot of them, especially the science fiction ones, have been in the business for a long time. The average age of that subset is probably 70. And you get a lot of attendees who match that subset, because they’ve been reading those authors forever. And then you have a lot of younger attendees, people in their teens and early to mid-20s, who grew up with the con because their parents dragged them along, and they have their own events and stuff, including a Harry Potter academy and so forth. But I had a good time, and I wrote quite a lot on my anthology story (which is running slightly longer than I anticipated) and I drew some pictures and plotted out some children’s book series. Landsquid needs another friend, but I can’t think of anything. Turtleduck’s kind of hard to draw (I’ve never had success in the leg department–maybe if I quit trying to do duck legs and give her turtle legs? I can draw turtle legs) and I would really need three characters for a picture book. I came up with a stealth rhino this morning (essentially a rhino with tiger stripes) but my husband says it’s not weird enough. Shall continue to ponder that. The very last panel of the con was called “Nanowrimo Support Group” and I ended up going to that, not because I plan to do Nano, but because I have done it for many years (this would be my 16th if I’d done it consecutively) and thought I could offer support. It was mostly us just hanging out, offering tips and talking about potential write-ins (everyone except one person had done it before), but it was still nice, and it got me thinking about Nano. Don’t get me wrong. I LOVE Nano. I don’t quite love the monstrosity it’s turned into over the years, but in those early years, when it was only a couple thousand of us, I got a lot–friends, stories, skills–out of it. I still love the idea, and I think it’s a great way to get going if you want to start writing. And I would be lying if, while I was sitting there in that room, with those other Nanoers, I told you that I wasn’t tempted. But it almost feels like I’ve outgrown Nano, or it’s outgrown me. It’s harder to do Nano if you have a serious project with a serious deadline, or if you’re editing, or if you’re co-writing, or a number of other situations. Still tempting, though. And maybe I’ll be in a position again sometime where it will make sense to do it again. How was your weekend, Squiders? Thoughts about Nano? One of the things I look forward to the most about MileHiCon is having some time to myself. Aside from some evening commitments and the panels I’m on (and the book signing time), I’ve got the whole weekend to myself, and I can do whatever I want with it. And MileHiCon has traditionally been very productive for me. Admittedly, when I was chained to the Turtleduck Press table in Author’s Row, I could get a ton done, and that’s not as true now that I’m free (freeee ahahahaha), but last year at least still proved quite useful. I tend to get overwhelmed at panels, so I don’t go to that many, no matter the convention (even when I go to writers’ conferences where there’s a ton of stuff to do, every now and then I skip a session to recharge). I’ll hit the artist’s alley (I love the artist’s alley and seeing all the cool stuff people have come with) and the vendors’ hall a few times, maybe watch some anime if something looks fun, watch the costume contest. That still leaves a lot of time. When I was table-chained, I often got some editing done, drew pictures for the blog, wrote short stories, etc. (The Internet does not really work in the hotel, so I have to plan ahead to make sure I can do what I want to do. But, on the other hand, I am not distracted by silliness.) Even last year, I wrote a short story and managed to get feedback on it throughout the weekend. So, knowing that I will have several hours to do whatever this weekend…what do I do? It’s one of those times when there’s too much possibility. I could do so many things. How do I pick? How do I focus? Do you do that, squiders, where there are so many opportunities you end up getting nothing done because you flit from one thing to the next? Because I do. And it’s problematic. Hm. Five options, and only three days. Decisions, decisions. A short would need to be plotted before hand (see, no Internet, so I won’t be able to access my idea file at the hotel). Nonfiction probably also needs Internet, so that might be out. What would you do, if you were me? But, sometimes, it’s hard to find time to sit down and write. And my laptop is getting older, so sometimes it takes a few minutes to get up and running. And sometimes it hurts my neck because invariably I’ve picked some place stupid to write and have been typing away with terrible posture. So every now and then I consider other options. I had a dictation program that I used for a bit right after the largest of the mobile ones was born. It still involves sitting at a computer, and there’s a learning curve while the program learns how you talk. Also it hated all my nonstandard fantasy names. So there was still a lot of fiddling to fix up what the program heard wrong. Which kind of eliminated the usefulness of using the dictation program. Also, I’m pretty sure said mobile one broke the headset that came with it, so that’s a bit of a problem. There’s another option which I have not previously tried, and that’s recording and typing it up (or having someone else type it up) later. Kevin J. Anderson, who is a very nice person and a very proficient author, works this way. He goes for hikes out in the wilderness, talking into a recording device as he goes, and comes home with two or three hours worth of story, which he sends to his transcriptionist to type up. Of course, some of us don’t have two or three hours to wander around talking to ourselves in the forest, but I admit the idea intrigues me. I could maybe do it while I folded laundry, or cooked dinner. Or maybe in patches when I find myself with a spare 15 minutes. My biggest worry is voice. I don’t talk like I write, and it seems like it would be awkward to learn how to tell stories out loud in a way that could be supplemented by (or supplementing) writing on the computer. Of course, I haven’t tried. Maybe it wouldn’t be so hard. I looked at audio recording apps for my phone, which seems most convenient (since I have my phone with me most of the time) but there was a ton of them, and I got overwhelmed and ran off. Have you tried recording a story and then transcribing it later? How did it work? Or do you know of a writer that works that way that has talked about their process?